When I saw the call from @fashionable_fitmum, Brittany, last week for guest bloggers to talk about their experience of body image I had a bit of a lightbulb moment. I thought, it’s time. It’s time to talk about my experience of body shame, and it’s time to start to move forward for the sake of my two young daughters so that hopefully they never have to feel the same shame in existing in their own skin. I feel like I was always ‘fat’. I was always the biggest amongst my school friends and they never really let me forget it from a very young age. Cursed with the name Kelly meant that it rhymed really well with ‘jelly belly’. Didn’t rhyme so well with fatso but that didn’t seem to bother some of my ‘friends’. One of the most vivid memories I have as a young child is the shame I felt that my own grandmother thought I was disgusting. I remember her v siting us one time and telling me that I was too fat, but I had nice legs for a girl my size.In primary school I remember having an argument with another girl who wanted to fight after school but then decided it wouldn’t be a fair fight because I could just sit on her.I used to cry after school a lot. I’m just thankful I went to school well before social media and cyber bullying. When I got to high school it got worse. I was never very popular at school and there was one group of girls who took a particular dislike to me and would take every opportunity to make snide remarks to me in early high school and then in Year 10 started getting physical in their abuse. PE was particularly traumatic. I was not very athletic and tried every possible excuse to get out of going to lessons. When I did go I usually found myself getting pushed into walls and slapped by these girls in the change rooms. I was also abused by one of the older boys at school when I was 13, this is a whole other story, but it further compounded the shame I felt around my own body. Despite academically doing well at school I left in Year 10, because I couldn’t cope with the abuse any longer. I found a wonderfully supportive group of friends in the Sydney gay and lesbian community, all of us very young, and all of us searching for some sort of acceptance of ourselves. We fell into a culture of using illicit drugs, alcohol and for some of us other forms of physical control over our bodies. For me I developed bulimia and an excessive obsession with the gym. At the time I remember I would still look in the mirror and see the fat girl staring back at me. I look at photos now and I can’t believe how thin I actually was. Any off hand comment from someone would send me for six. We had some overseas visitors staying for Mardi Gras one year and we were all dressed in fabulous costumes. I was dressed as a cheerleader and I felt amazing until one of the guys said to me that I looked pretty good although I would probably never be really thin. The next few years I found myself in a very psychologically abusive relationship. My then partner controlled almost every aspect of my life from finances to who I was allowed to keep as friends and when I was allowed to see my family. One of the forms of control was to tell me that no one else would want to be with me, I was fat, and that I was lucky to have someone. The only way I knew how to deal with it was to eat my feelings and I put on heaps of weight again. I eventually found the courage to escape and moved to Tasmania. This was probably the start of when I actually started to embark on discovering who I actually was. It certainly wasn’t an overnight revelation though. I still sought validation and acceptance from everyone I interacted with. I still entered into damaging relationships with the wrong people but I was getting stronger and more independent. I moved back to Sydney temporarily before moving to South Australia. I met my now husband in South Australia. I finally found someone who has never done anything but be supportive and encouraging, he has never made me feel inadequate and has always made me feel like I can achieve anything I want to. He tells me he thinks I am beautiful and how much he loves me. He builds me up and makes me want to be a better, stronger version of myself. South Australia is also where I started to embrace a life of fitness in a more healthy way. I discovered activities that made me feel strong and powerful. I found I loved to hike through the bushland, I loved to lift weights to make my body strong, I found I loved to be in the ocean without just focusing on whether people were judging me for how I looked in a swimming costume (although it still was a real concern) and I discovered a love of running. At first I started running to increase my fitness for the hiking I was doing with some other women. But then I found that I loved running for the feeling that running gave me. It allowed me the space and freedom from life. It was a way to escape the every day and a way to meditate on what was happening for me. I participated in my first half marathon just before I participated in a team 100km hiking event. I was the strongest and fittest I had been in my life and then just to turn it all on its head again I fell pregnant with my first baby. We had a fairly difficult first few months with her needing surgery straight away and in hospital for the first month of her life. When we got her home we needed to keep her away from outside germs for a few months so I was incredibly isolated. I found my weight ballooning again and my self confidence plummeting. The friends I thought I could depend on in South Australia had disappeared and I had no support other than my husband. I still had my lifelong friends but they were interstate or dealing with their own major life changes and I sunk into fairly deep depression. I eventually got out and made a few new friends with kids. We then we decided to have another child so that they could be close in age (and before I got too old). Once my second daughter was born and we were in the groove of having twice the chaos I made the decision that I had to do something about my weight and my fitness. On January 4 2015 I started a program called Lose Baby Weight. By following their 28 day plans I started to cut out processed foods once and for all, with their step by step instructions I started to cook food from scratch, which I had never had the confidence to do before, and most importantly I started to refocus on my fitness. 18 months on and I have lost 20kg, I have regained my love of running and strength training and I have (not everyday but) mostly regained my self-confidence. 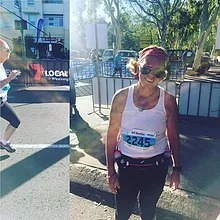 I recently competed in another half marathon and smashed my time from pre pregnancy. This weekend I will be competing in the Gold Coast half marathon and hope to better it again. My husband, my children, and I are currently travelling around Australia and I am (mostly) maintaining my weight and my fitness despite travelling. I am making healthier choices for my family and I am trying to set an example for my daughters that being strong and fit and healthy should be the focus and not whether we are thin or how we look in a bikini. The scary thing is that even at their ages there seems to be a consciousness of body image. My oldest daughter recently told me that she had a ‘big bum’. She is tiny, but even if she did, she is not yet four years old! So I know owe it to them to make sure they do not develop negative body image and a life of body shaming. I am conscious about what I say about myself and I am determined they will not be as damaged as I was regarding their bodies. I am conscious about what I say about other women and I am conscious about what other people say to them. The cycle needs to stop. I am not naive enough to think I can shield them from a negative body image but I will do everything I can to try and instil in them a love of healthy food, a love of whatever physical activity it is that they enjoy and a love of what their healthy bodies can help them achieve. You can follow our adventures on our Instagram and blog.